This was like a flavor explosion in my mouth. So much fresh flavor is happening here. 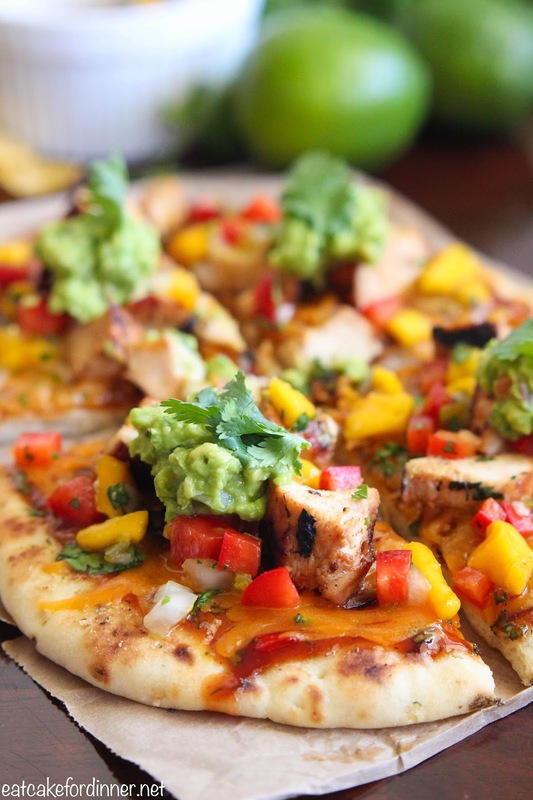 Soft and chewy naan bread, sweet and tangy sauce, tender chicken, sweet and spicy salsa and guacamole. This is one of my favorite meals so far this Summer. I adapted the chicken from this recipe. The honey in the sweet chicken marinade creates this amazing charred flavor when you grill it. The flavors all go perfectly together. I will definitely be eating this one again very soon. For the chicken marinade: Combine honey, oil, lime juice, chili powder, Worcestershire sauce and chopped cilantro in a large zip-lock bag. Shake until well combined. Add the chicken, seal bag, refrigerate and allow to marinate at least 3-4 hours. When ready, cook chicken on a preheated grill until internal temperature registers 165 degrees on an instant-read thermometer. Remove from grill. Throw naan bread on the grill until warm and slightly charred, about 1-2 minutes per side. 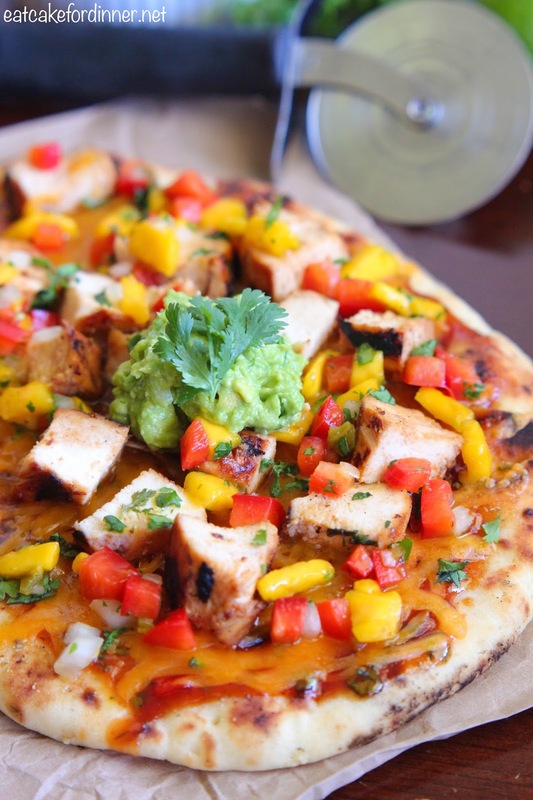 To prepare the pizzas: Chop the cooked chicken; set aside. Combine honey, lime juice, chopped cilantro and BBQ sauce and spread over one side of each naan bread. Top each with shredded cheese and chopped chicken. Broil until cheese has melted (or you can always throw back on the warm grill). 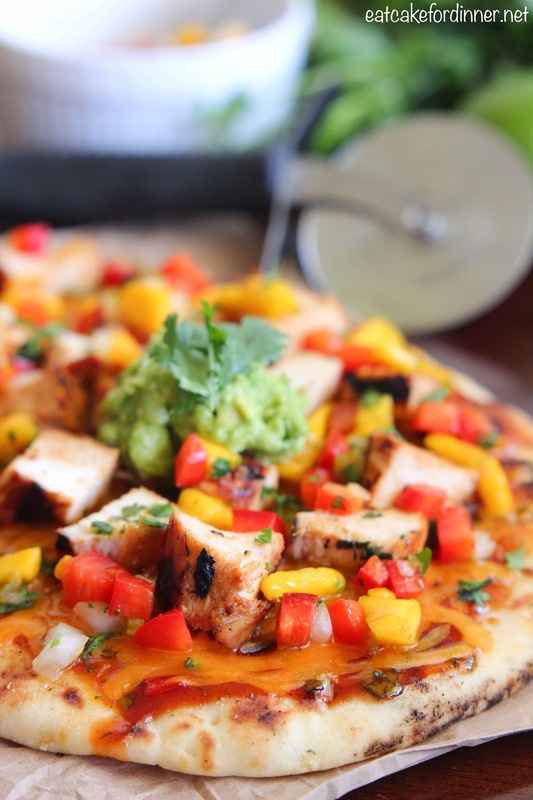 Remove from oven and top with mango salsa and dollops of guacamole. Slice and serve. Serves: 2-3.